Biosensors are becoming increasingly important bioanalytical tools in the pharmaceutical, biotechnology, food, and other consumer oriented industries. The technology, though well developed in Europe, is slowly developing and has begun to generate interest in the United States only over the past couple of years. Research is now being directed toward the development of biosensors that are versatile, economical, and simple to use. 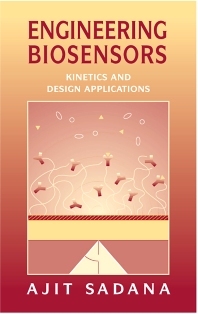 Engineering Biosensors is a comprehensive introduction to biosensors that includes numerous illustrations to further explain the main concepts and practical examples from existing literature. It describes what biosensors are, where they are used, and how their performance is affected by existing surface characteristics. A better understanding of biosensors, as provided by this book, will greatly assist in the design of new as well as the improvement of existing biosensors. Readers are also provided with invaluable and hard-to-find data on the economics of the biosensor market to assist them in better understanding the market and where it is heading. Senior undergraduate and graduate students in biochemical engineering. Chemists, biochemists, environmental analytical chemists, immunologists, and biochemical engineers in academia and industry. Instrument manufacturers in the healthcare industry. Dr. Ajit Sadana has recently retired from the University of Mississippi after 34 years. His expertise is in the area of kinetics of binding and dissociation of analytes on biosensor surfaces.